/ Ride With Me This Summer! The hardest part of my job isn't the training or racing, it's everything else that surrounds it. One of those challenging elements is having to turn down the chance to ride with family, friends, and fellow cycling enthusiasts. But this summer, there are two chances for me to ride with anyone and everyone, and I want you to be there! The bonus: both events are for a great cause! On June 1, join me in Boston for the 20th annual Best Buddies Challenge. There are 3 bike rides, and a 5km run/walk. I will be doing the 100km ride from Boston to Hyannis Port (Cape Cod) along with Christian Vandevelde and George Hincapie! Either somebody heard that I love FloRida's music or, it's just that I'm extra lucky - because he'll be peforming for us when we arrive! And if you show up the day before (like I will be), you'll be treated to Guy Fieri's cooking. I hear there will be all you can eat LOBSTER. Seriously... could this event get any cooler? Why I'm doing this: Like Silicon Valley Bank, practicing inclusion and celebrating diversity is important to me. The Best Buddies foundation helps empower people with intellectual and developmental differences by providing opportunites for them to create friendships in the community and to integrate into the workplace. On July 5-6, join me on a breathtaking two-day ride in the Laurentians region of Québec. It's called the Tour Charles Bruneau. 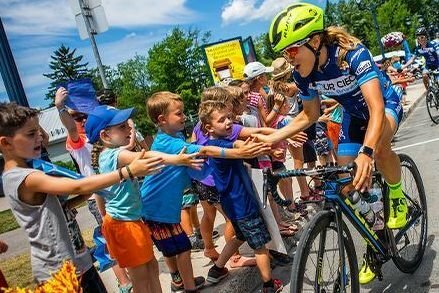 We'll start in Mont-Tremblant (the famous ski town, and home of an internationally acclaimed Ironman race) and pedal to St. Jérôme on some of my favourite training roads. After a luxurious hotel stay, we'll head off to Boucherville the next morning where we'll be greeted with some of the most exciting and heartwarming celebrations I've ever experienced at an event. The Tour Charles Bruneau offers several treks. The route I'll be riding is the Fondation Charles Bruneau's Trek of Inspiration. I am proud to be the spokesperson for Inspiration route for the second consecutive year, after having been involved with the Tour since 2015. The Fondation Charles Bruneau helps children battling cancer and their families by providing access to state of the art medical technologies, networking and support systems for families, and funds for research grants that have made huge impacts in pediatric cancer treatment. One of the most special things about this event is getting to know the children that the participants' fundraising affects directly. Seeing them throughout the tour, learning about who they are, not only as a patient but as a kid, and just getting to plain ol' hang out together is part of what makes most riders return year after year.